Full disclosure. Like most Netflix viewers, I am completely ignorant of the Japanese manga series on which this is based, or the various adaptations of this into other media, both anime and live-action. I do not care about how true (or not) to these versions this film might be. I am interested only in how well this functions on its own. And the answer is… s’alright, I suppose. If you’re looking for a cross between Final Destination and Heathers, together with a slab of angsty teenager wish-fulfillment, you’re in the right place. Light Turner (Wolff) is your typical high-school loner, who has a dubious side-income selling homework papers, but generally tries to keep his head down and avoid attention. It doesn’t always work, and he crosses paths with the school’s bully, to his detriment. 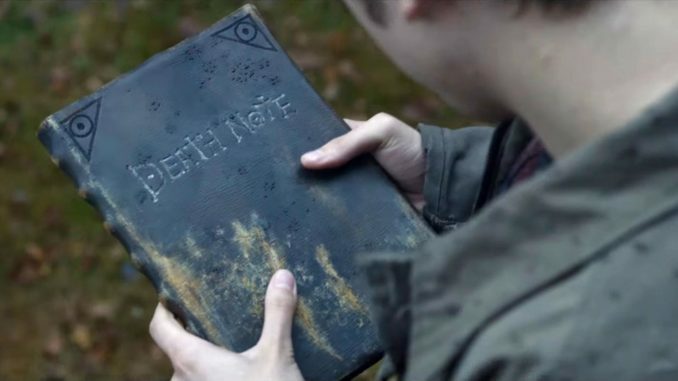 Then, in a flash of lighting, a mysterious notebook literally falls from the Seattle sky, with the title DEATH NOTE on the cover, like something from the remainder aisle at Hot Topic. The principle is simple: write someone’s name in the book, while picturing their face, and they will die. You can specify the manner of their death if you wish. Of course, it isn’t quite as simple. The notebook comes with so many rules, it resembles a mortgage agreement more than a magic artifact. It also comes with a guardian: Ryuk (voiced by Dafoe), a spiky death god only the book’s owner can see, whose appearance triggers a surprisingly girly shriek out of our hero. 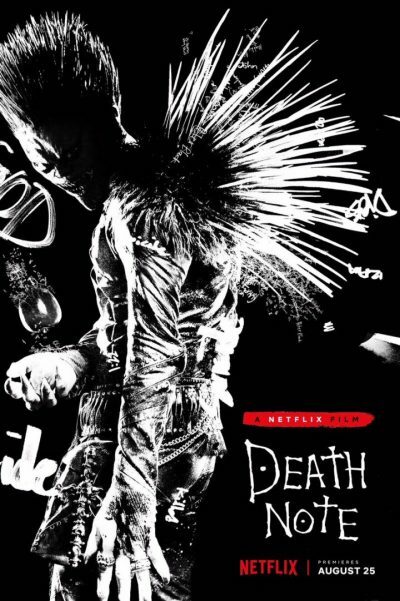 Ryuk carries out the deaths, be they simple or complex – and the first would draw a round of applause from the Final Destination grim reaper, that’s for sure. The notebook also attracts Mia Sutton (Qualley), a classmate of Light’s, who is perpetually egging him on. The dark power has a seductive hold over this cheerleader, who wants to wield it a good deal more energetically than he does. They settle on a plan to improve the world by using the book to rid it of criminals. It’s a shame the film didn’t go into this approach a bit more, as it’s one of the potentially more intriguing aspects, but is whizzed through in about a two-minute montage. Mia and Light set up a fake entity called “Kira” to take the blame, who becomes a cult sensation as a result. It also brings them to the attention of the authorities, and in particular an eccentric detective, known only as “L” (Stanfield), who carefully guards his identity, to avoid becoming a target for Kira. L travels to Seattle where – what are the odds? – Light’s father is a police detective investigating the Kira killings. As they close in on the true identity of Kira, Mia decides to take whatever steps are necessary, to ensure that this doesn’t happen. Which is where the film finally topples over into silliness, twisting itself into a cinematic pretzel on the way to a finale atop a Ferris wheel. There’s no shortage of ideas here, and that may be the problem. I get the feeling this would have been better suited to a series, rather than trying to cram everything from start to finish, into not much more than 90 minutes. It needs a much better sense of escalation, taking the audience alongside Light and Mia, as their power corrupts. Instead, we suddenly find ourselves suddenly watching FBI agents fling themselves, like black-suited lemmings, off roof-tops. Similarly, the hints at L’s background in a government black budget operation (Montauk) are not explored in the way it could have been. That becomes just an excuse for another Death Note, as Light sends L’s sidekick off, to try and discover the detective’s identity. And the apparently copious rules are barely referenced after they’ve been introduced. What’s the point of them? Not least because the obvious and logical one – “No-one but the owner gets to write names in the notebook” – is notable by its absence. It feels as if the creators here didn’t dare risk the fan-boy ire, which would have resulted from making the drastic alterations, necessary for this to succeed as a stand-alone film. I get the sense it either needed to be more faithful to its source, and not a single movie, or discarded everything but the central concept and gone its own way entirely. Instead, it occupies a spot somewhere in the middle, unlikely to satisfy fans of the source material and probably leaving newcomers like myself, wondering what all the fuss is about.